As the company is focussed on providing luxe metal components to the fragrance and luxury cosmetic industries, the new design is set to convey a rich, high-end look and feel that matches the variety of products the company offers. Revolving around a simple menu system and staid yet sumptuous colouring, the site features easy sub-navigation that pops under the primary menu when an item is clicked. 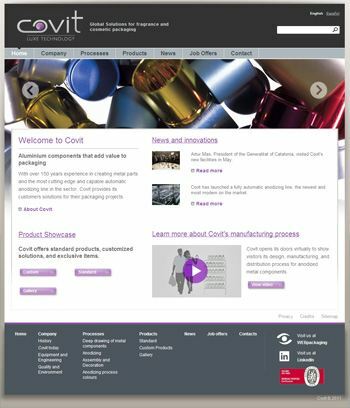 In order to ensure purchasers find what they’re looking for, Covit has ensured the new site’s navigation is proof against getting lost, with resident text links at the bottom of the page that also provide navigation for those with impairments when read by special accessibility software. Further, the company has provided a section entitled PROCESSES that explains many of the methods used by the company, to acquaint industry folk with their particular systems and operations, including metal deep drawing, anodizing, colouring, and more. The company has also created an entertaining and informative video PACKstory that outlines the process related to the creation of metal components, from beginning to end. To round out the offering, the company has created a full PRODUCTS section, with attractive images and full product descriptions - perfect for buyers looking for easy to use references when looking to place an order. The website was designed and launched by WebPac, WEBpackaging's parent company. WebPac is one of the few web firms in existence with vast experience in the production of packaging websites, with literally hundreds of sites related to the packaging industry successfully launched.